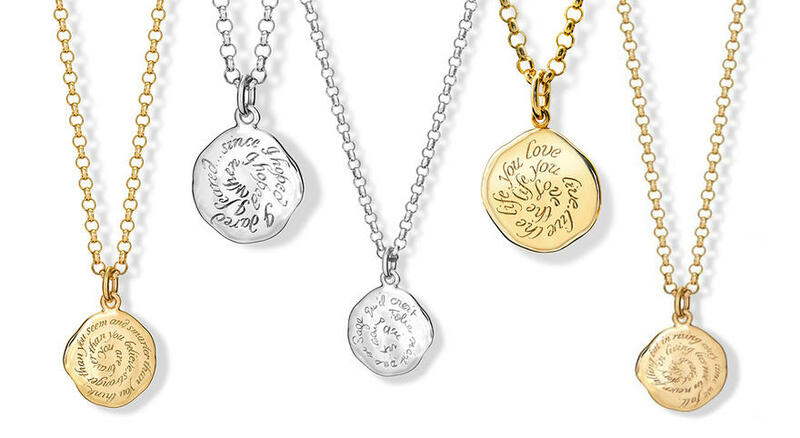 Cassandra Goad quote pendants are the perfect present for any occasion, available both in yellow gold and silver. Give me the Serenity… - engraved with the words of the prayer: 'Give me the serenity to accept the things I cannot change, the courage to change the things I can, and the wisdom to know the difference'. Never Assume - 'Never assume…' from a friend of Cassandra. Love the life… - 'Love the life you live, live the life you love' Inspired by the words of Bob Marley. Courage… - 'Courage, perseverance, patience.' Inspiring words from a friend of Cassandra. Qui vit sans folie… - 'Qui vit sans folie n'est pas si sage qu'il croit'. Madame Guerlain, He who lives without fun is not as wise as he thinks. When I hoped… - 'When I hoped I feared… since I hoped I dared.' Words from the poem LXVI by Emily Dickinson 1830-1886. Onwards... - 'Onwards…' from the writings of Henry Worsley the Shackleton expedition explorer who died in 2016. A donation will be given to the Shackleton Foundation. The greatest glory… - 'The greatest glory in living lies not in never falling, but in rising every time we fall.' From the words of Nelson Mandela. A donation will be made to the Desmond and Leah Tutu legacy foundation. If you dont... - 'If you don't explore you'll never discover'. From Alice in Wonderland by Lewis Carroll. Winner of the National Poetry Day Competition. Feet, what do I need them for … - 'Feet, what do I need them for if I have wings to fly' Words from the Mexican artist Frida Kahlo. Dare, always dare…. - Specially created by Cassandra for the Old Vic to commemorate their 200th anniversary in 2018. 'Be thou my vision O Lord of my heart'…. - Words from the Irish poem "Rop tú mo Baile", and often attributed to Saint Dallán Forgaill in the 6th century. 'Visible things are temporal, the Invisible are eternal……' - Words engraved from St Paul's letter to the Corinthians Ch. 4 verse 14 - chapter .5 verse 1. 'May love abound all round…' In memory of Horatio Chapple, an aspiring doctor. A donation will be given to Horatio's Garden.